Michigan Future Inc. today released a report saying Michigan must create regions anchored by central cities that attract college-educated individuals before it can have a broad middle class. The non-partisan, nonprofit organization says attracting such individuals will create a talent abundance that will retain and attract knowledge-based companies to the state. The report, “A Path to Good-paying Careers for All Michiganders: Creating places across Michigan where people want to live and work,” suggests how to create such metropolitan communities. The report is the last of a series of four by Michigan Future that outlines how the state has failed over the past 20 years to adapt to the changing international economy and provides a plan for policymakers who want to see the state become more prosperous. The report calls for Michigan to stop cutting taxes and instead invest in human capital; become more open and welcoming to all, including immigrants; develop modern transportation, water, and communication infrastructure that features mass transit; and give communities and regions more flexibility in financing and spending. According to the report, talent leads to economic growth. The key to retaining and attracting talent is creating places where people want to live and work. The report suggests that knowledge-oriented employers, such as those in the automotive industry, are working to become a magnet for younger talent in order to succeed. For example, Dearborn’s Ford Motor Co. is renovating Michigan Central Station as part of its soon-to-be mobility and autonomous technology campus. Transportation as the most important placemaking public investment. A major solution offered by the report is to increase flexibility for regions and cities to develop and finance their own solutions, as each has unique needs. It suggests giving regions the ability to provide infrastructure, basic services, and amenities, and to finance those metropolitan services through regional taxation policies through either local sales taxes or fees on services. The local freedoms must be combined with a substantial increase in returning state revenue to local governments in a way that encourages regional cooperation. The four reports are based on Michigan Future’s argument that Michigan will not have a mass middle class until it has transitioned to the knowledge economy. They are available here. 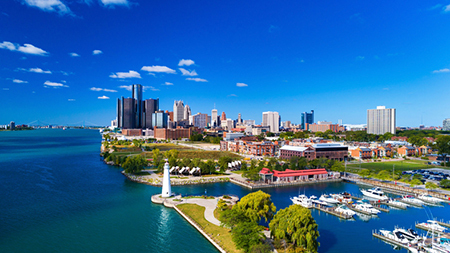 Michigan Future’s mission is to be a source of new ideas regarding how the state can succeed as a world-class community in a knowledge-driven economy. Michigan foundations fund its work.